UNITED NATIONS (WUP)---"What we have witnessed today is not the end of a story, but the beginning of a new one," said Israeli President Shimon Peres, speaking at a press conference following his appearance November 12th at the General Assembly's two day high-level meeting on, "Interfaith Dialogue promoting a Culture of Peace." The meeting, which was initiated by King Abdullah of Saudi Arabia included the participation of twenty Heads of State, of which many were Kings and Emirs of the Arab world. Senior officials of more than 75 countries attended. The Conference was generally praised because of the unprecedented bringing together of people who might not otherwise have a chance to interact. 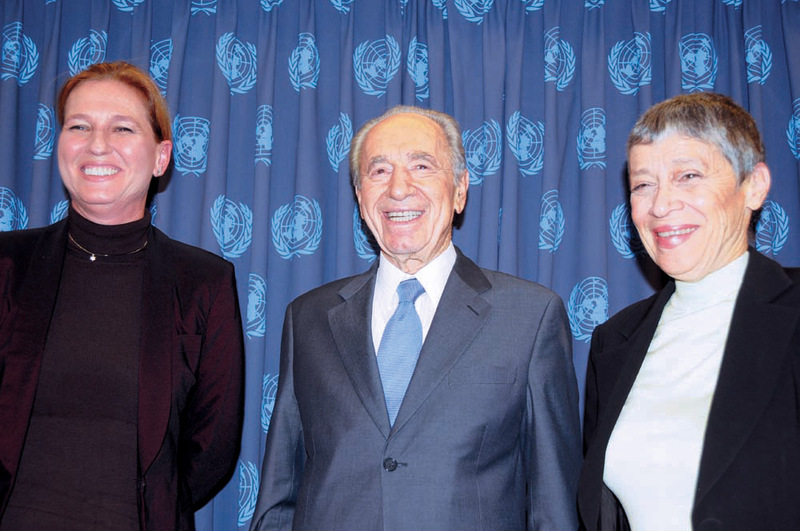 Reminding correspondents of the "three no" Arab approach to Israel - "no recognition, no negotiations, no peace" - Mr. Peres said, "Today we have heard a totally different voice: a voice of friendliness, of understanding, and also of the feeling that the time has come to try to have an overall peace in the Middle East." He said King Abdullah of Saudi Arabia had spoken with a strong and highly respected Arab voice. Joining Mr. Perez at the press conference were Israeli Minister for Foreign Affairs, Tzipi Livni, and Israel's relatively new Ambassador to the United Nations, Gabriela Shalev. Ms. Livni said King Abdullah's initiative sent an important message to the region that the conflicts there had nothing to do with differences between religions, nor were they conflicts between faiths. "The conflict comes from the abuse of faith and its followers by extremists who try to get more political power," she said. "Those who pay the price for this hatred are the believers themselves, and all those who would like to live in peace," she added. Today's meeting should be the beginning of a common and mutual fight against that kind of extremism, before it becomes too late. Ms. Livni, currently the chief Israeli negotiator in ongoing talks with the Palestinians, said that extremism was also sometimes used as an excuse by those who did not want to pursue the peace process. However, for the first time now, there was a growing understanding among regional leaders that they could no longer afford to allow such extremism to flourish within their borders. "This is something that acts against your own people, it acts against you as a leader and it acts against any possibility to reach peace in the Middle East," she said. Describing those Israeli-Palestinian talks, President Peres said the gaps between the two sides had been seriously narrowed. "We can see the shore of peace closer than ever before and, maybe, an overall peace." Asked by correspondents about the possibility of reaching a final peace agreement by the end of 2008, Ms. Livni said that efforts were ongoing to conclude by the end of the year. However, a comprehensive peace agreement needed to be concrete enough to be implemented and reaching that agreement prematurely, just because of the hour on the watch, was not necessarily the best option. She stressed the need to let the bilateral negotiations continue and to allow the two sides time to find solutions to the problems. When representatives from Israel and Palestine addressed the international community at the recent meeting of the Quartet, they spoke the same language. "We said, "'Give us the possibility to continue the bilateral talks.' We don't need any international intervention, we don't need to bridge gaps by the international community, and we don't need new plans. We are determined to continue the process in a manner that hopefully, in the future, can bring peace to the region." It was crucial for the Arab world to support the bilateral peace talks between Israel and Palestine, said Ms. Livni, since the Palestinians especially, would need that support. Indeed, those negotiations needed the support of the entire international community, including the Arab world, and States should therefore embrace the ongoing efforts. Asked by a correspondent about what sort of compromise solution could be found for Jerusalem, President Peres said that the reality was that Jerusalem was already being shared by many religions, including Jews, Muslims and Christians. "Everybody prays and the prayers go straight to heaven, without the intervention of any Government." However a more formal solution for Jerusalem was an extremely sensitive issue and now was not the time to raise it. In response to a question on the recent clashes in Gaza, President Peres said that if Hamas chose to break the ceasefire by building tunnels filled with explosives to bomb settlements in Israel, Israel had a legitimate right to defend itself. Similarly, Ms. Livni underscored the fact that Israel was not looking to act against Palestinians; what Israel was doing in Gaza was to try to avoid any kind of terrorist act or missile attack against it. Hamas was not willing to live in peace or willing to renounce violence and terrorism.